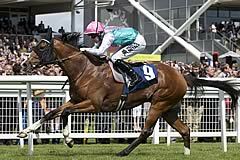 Two years ago Frankel, trained by Sir Henry Cecil, won the QIPCO Champion Stakes - today it was the turn of Noble Mission, Frankel's brother, trained by Lady Cecil, widow of the legendary trainer. Both horses are owned and were bred by Prince Khalid Abdullah, who mated his superb mare Kind with the world's leading stallion, Galileo, and produced two outstanding siblings. Frankel is now a stallion in his own right at Prince Khalid's Banstead Manor Stud in Newmarket, where his brother will take up residence one day. Remarkable doubles rarely come with more poignancy, and this one followed a compelling home-straight battle between the winner and runner-up Al Kazeem, who pulled clear of their rivals. Noble Mission had made the running from the stalls, been passed by the second approaching the furlong pole, but showed an iron will to grind his way back into the lead. He won by a neck, with Free Eagle a further length and a quarter back in third. Winning jockey James Doyle forged a brilliant partnership with Al Kazeem last season when they teamed up to win three times at the top level. Today, his retainer with Noble Mission's owner meant George Baker rode the second. 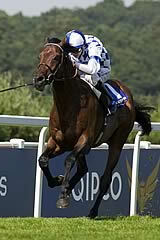 Lady Cecil was shaking as she told the press: "I knew that if he won it would be a fairytale and it absolutely was. James gave him a brilliant ride - we knew the horse was in the form of his life, but we hardly dared to dream it could happen. It's a tough race and he absolutely toughed it out. "I thought it was all over [when Al Kazeem edged ahead], but he just dug deep and James gave him an incredible ride. This is so special because of what happened two years ago - I keep thinking I'm in a dream and will wake up. It has come true hasn't it? "I had my head in my hands [in the closing stages] because I didn't think he would hang on, but he's so brave. Martin [his groom] who rides him every day and virtually sleeps in his box said he was in the best form. I've had so much support from so many people and I'm so grateful. "Can you imagine when Henry died if we had given everything up? It was easier to keep going at the time and it was a way of staying close to him. I am so lucky with my owners - Prince Khalid has been incredibly loyal and the Niarchos family. I am so lucky to be at Warren Place and I don't have the words - my heart is pounding. I am so pleased for everyone at home as well." Lord Grimthorpe, racing manager to Prince Khalid, said: "James produced a great ride on an incredibly good, tough and classy horse. He put them to it, held them off, stuck to it and had a huge battle with Al Kazeem - to do that with that quality of field is remarkable. It's nice to emulate your brother!" Asked if five-year-old Noble Mission would now be retired to stud, Lord Grimthorpe said: "It's in Prince Khalid's hands - he could go to stud or stay in training. Two years ago when Frankel was in this very same position I said to Prince Khalid 'They are going to ask what your plans are for the horse?' and I didn't know at the time. He just said 'That is it' and Frankel was retired - I wouldn't think he would run again this year because he's had quite a race today. "What a happy day and the emotions of the whole thing - with Jane, and the history of Champions Day with Henry, and the brother of Frankel - it's amazing. 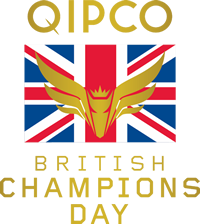 Al Kazeem produced a performance near his very best in the QIPCO British Champion Stakes at Ascot this afternoon and was just denied by Noble Mission in a thrilling climax to the Group One contest. The 16/1 shot battled all the way to the line alongside the eventual winner but couldn't quite manage to get his head in front where it mattered, going down by a neck with Free Eagle a further length and a quarter back in third. Jockey George Baker was full of admiration for the six-year-old, who returned to the track earlier this year following a brief, if unsuccessful, spell at stud. "They didn't go that quick up front which has helped him relax," said Baker. "I thought that we'd got the measure of Noble Mission half a furlong out but he's battled back really well. "I'm delighted for connections and also for Al Kazeem, as it's great to see him back to his best. I'm also delighted for James (Doyle - jockey of Noble Mission) who rode him last year, as he deserves another big race success." Trainer Roger Charlton was visibly emotional after the race and felt his entire hadn't quite been given the respect he deserved following a good run in the Prix de l'Arc de Triomphe at Longchamp last time out. "What can you say?" said Charlton. "I thought that his price was an insult at the beginning of the week as he wasn't beaten far in the Arc and finished alongside Ruler Of The World, who was a lot shorter in the betting.